DALLAS, TX--(Marketwired - Oct 26, 2016) - Parks Associates today released its updated top 10 list for subscription over-the-top (OTT) video services, based on number of subscribers, with Netflix retaining its top position while services Sling TV, Showtime, and CBS moved up or entered the list over the past year. "Importantly, all of these services have increased their subscriber base over the past year. The top five OTT services have stayed consistent, primarily through maintaining or growing the massive user and subscriber bases that they have built over the past several years," said Brett Sappington, Senior Director of Research, Parks Associates. "Showtime and CBS All Access have made a significant push into the OTT space. Their recognized brands and popular content, including Showtime's Homeland and Ray Donovan, have provided them with a good basis for building an OTT service. Sling TV has continued to evolve its offering, testing new options and adding several new channels in order to grow its customer base." Sappington noted that MLB and WWE continue to lead in sports-related OTT video services. "In addition to MLB.TV's organic growth, T-Mobile subscribers received a free subscription to MLB.TV at the beginning of the baseball season," Sappington said. "The WWE Network has continued its growth. In its 2Q 2016 financials, WWE reported that it had 1.5 million paying subscribers for its WWE Network, up from 1.2 million a year earlier." OTT video service providers, which captured over 200 Emmy nominations and over 40 wins this year, have prompted "the return of the living room" in the connected home through their association with quality original programming. In 2014, the computer outranked the TV in use among OTT subscribers, but now the TV is the dominant OTT screen. "We are clearly seeing OTT video moving to the television," Sappington said. "OTT users watch OTT services on their TV screens between 17-20 days per month, much more than platforms such as a PC, smartphone, or tablet." 63% of U.S. broadband households subscribe to an OTT video service as of the third quarter of 2016, up from 57% at the beginning of 2015. Overall OTT video service adoption is approximately 15% higher among Latino and Hispanic U.S. broadband households when compared to all U.S. broadband households. One-half of Latino or Hispanic U.S. broadband households are service stackers and subscribe to two or more paid OTT video services. Latino or Hispanic American broadband households also have the highest adoption of sports services (29%) and Netflix (64%) when compared to the national average. Most major OTT video services receive a positive NPS (Net Promoter Score). For example, Netflix's NPS in 1Q 2016 was 38. By comparison, the overall NPS for U.S. pay TV among its customers is -38. 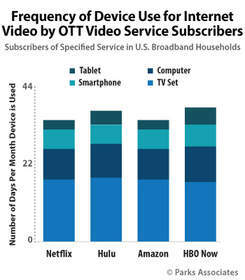 For more information about the OTT Video Market Tracker and related research, contact sales@parksassociates.com. View the top 10 list from November 2015. To schedule an interview with an analyst or to request specific data, please contact Holly Sprague at hsprague@gmail.com.